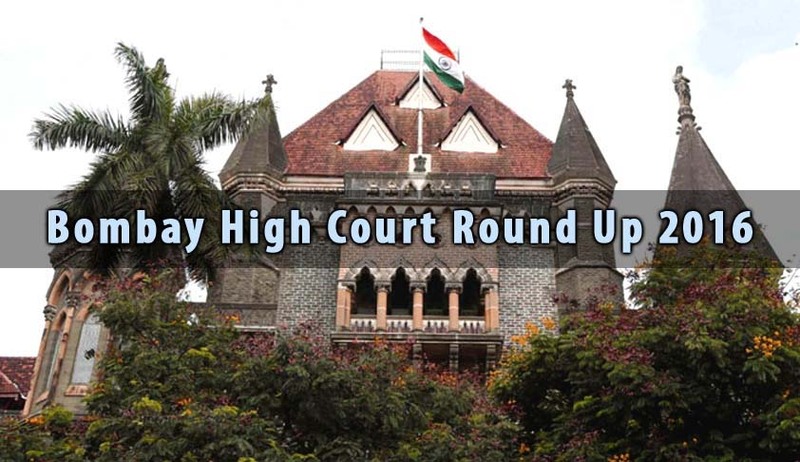 Bombay High Court passed orders and judgments in several important cases this year. The highest court in the state laid down the law, altered legislations and in the process contributed significantly to jurisprudence in India. This year also saw two separate tenures of Chief justices, while CJ DH Waghela was appointed on February 15 this year, he retired on August 10. His tenure lasted for a little over six months. Following this, CJ Manjula Chellur was appointed on August 22. She was formerly the Chief Justice of the Calcutta High Court. Chellur J is the second woman Chief Justice of the Bombay high Court after Justice Sujata Manohar. She is due to retire in December next year. As 2016 comes to an end, let us take a look at eight of these important judgements by the Bombay High Court this year. The division bench of Justices Naresh Patil and SB Shukre commuted the death sentence awarded to Himayat Inayat Baig, the lone convict in the German Bakery Blast case to life. The bomb blast happened at German Bakery at Pune in 2010. Baig was convicted by a Pune court and awarded a death sentence. Baig was found guilty of possessing explosive substance and forged documents, he has been convicted under Section 5B of The Explosive Substances Act, 1908 and Sections 465, 467, 468 and 474 of the IPC. The court found Baig not guilty on all charges under Unlawful Activities Prevention Act, 1967. State government has appealed against the Bombay High Court order before the Supreme Court. A division bench of Justice Ranjit More and Justice RG Ketkar ordered the Union Ministry of Environment and Forests to demolish the Adarsh Co-operative Housing Society (ACHS) building in Mumbai. Court was hearing a 2011 appeal by ACHS against an order of demolition passed by the Ministry of Environment and Forests. The MOEF had ordered demolition on violation of the Coastal Regulation Zone (CRZ) norms. A 12 week stay on the order was granted upon request by Senior Counsel Navroz Seervai, who was appearing for ACHS. In July, apex court stayed the demolition and ordered the Ministry of Defence to secure the building until further orders. The society which was originally meant to be a six-storey structure to house Kargil war heroes and war widows, was converted into a 100-metre-tall building with 31 storeys. The High Court also asked the government to initiate civil and criminal proceedings against the ministers, bureaucrats and other politicians involved in the scam. In a 225 page judgement, division bench of Justices AS Oka and SC Gupte struck down Sections 5D and 9B of the Maharashtra Animal Preservation Act. These provisions were inserted by the state government through an amendment to the 1976 Act. While S.5D imposed an embargo on possession of beef slaughtered outside the state, S.9B put the onus of proving innocence on the accused. The HC judgement pruned the amendment brought in by the state government by striking down two of the harshest provisions. In September, the apex court issued notice to the state government seeking it’s response while hearing a petition challenging the HC order. The bench of Justices SC Dharmadhikari and Shalini Phansalkar Joshi set aside the cuts ordered by the CBFC in the movie Udta Punjab. The film was based on the drug menace in Punjab. Senior Counsel Ravi Kadam appeared for the producers of the movie argued Freedom of Expression and deemed the cuts ordered by CBFC as arbitrary and bizarre. Bombay High Court held that in order to become a junior division civil judge, it is mandatory for a candidate to clear all exams leading to the degree in first attempt. However, this rule is applicable to fresh law graduates only. A bench of Justice SC Dharmadhikari and Justice Shalini Phanslkar Joshi held this while hearing a petition filed by a candidate for the post of junior division civil judge. The candidate’s name was removed from the merit list after it was discovered she had cleared one of her law papers in second attempt. In a landmark decision, division bench of Justice VM Kanade and Justice Revati Mohite Dere struck down the ban on entry of women inside the inner sanctorum of the Haji Ali dargah. The judgement authored by Justice Revati Dere held the embargo on women’s entry in violation of Articles 14, 15 and 25 of the Constitution of India. Although the dargah trust moved SC against the HC order, after a nudge by the apex court, the trust finally agreed to allow entry of women inside the sanctum sanctorum. In a huge relief to medical students from Maharashtra, division bench of Chief Justice Manjula Chellur and Justice MS Sonak refused to interfere in the domicile rules brought under Maharashtra Unaided Private Professional Educational Institutions (Regulation of Admissions and Fees) Act in August this year. The petitioner students argued that the domicile criteria brought under the rules framed in August 2016 was a case of ‘wholeslae reservation on basis of domicile’ and these rules impose ‘unreasonable restrictions’. Students from outside the state only have the option of the 15% seats that were made available after the state government had amended its rules in September this year to include them in the ‘institutional quota’ which was only meant for NRI students earlier. A full bench of the Bombay High Court held that a Hindu can marry 90 days after his/her marriage has been dissolved through a decree, provided no appeal is pending against the decree. The primary question before the full bench comprising of Justice Naresh Patil, Justice RD Dhanuka and Justice Sadhana Jadhav was that whether an appeal under Section 19(1) of the Family Courts Act, 1984 will be governed by the period of limitation prescribed under Section 19(3) of the same act or Section 28(4) of the Hindu Marriage Act, 1955.